In chapters five through seven the writer of the Gospel of Matthew records Jesus’s well-known sermon which is known as “The Sermon on the Mount.” The beginning of the sermon, found in Matthew 5:1-12, is called the Beatitudes in which Jesus declares certain groups of people “blessed” and then provides the reason why they are blessed. The Bible does not tell us specifically on which mount this sermon took place, and therefore the exact location is unknown. What the text does say, however, is that “Jesus…went up the mountain.” So, why do people think this is the location of the “Mount of Beatitudes?” Why visit this place if it’s not the actual place? The Mount of Beatitudes is located between the towns of Capernaum and Tabgha. According to Matthew 4:12-13, Capernaum was the center of Jesus’s ministry in the Galilee. The present site has been recognized as the location since at least the 4th century when a Byzantine Church was built here. The church remained in use until the 7th century. The location provides plenty of space for a large crowd to gather. The view from the mount overlooking the Galilee is beautiful! Looking out over the Galilee one can see many of the places where Jesus’s ministry took place. 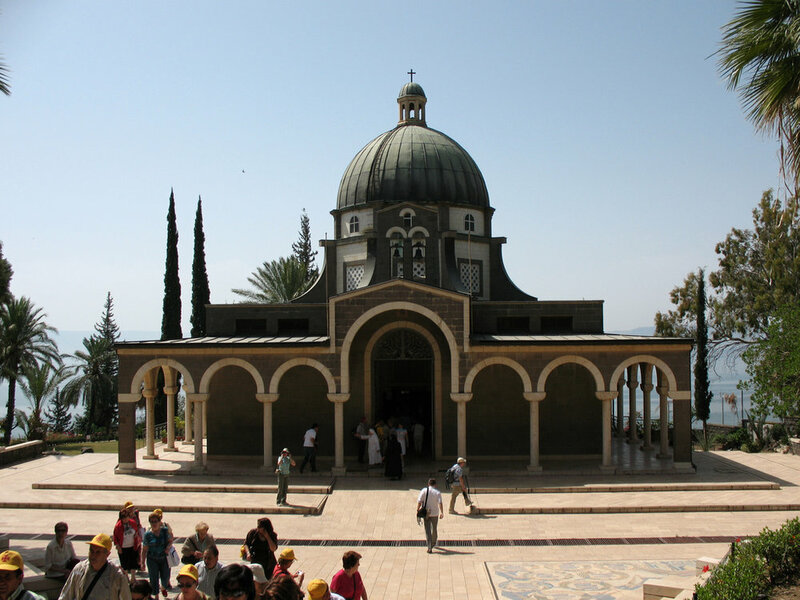 The octagonal Church of the Beatitudes on the mount provides a quiet place for reflection and worship. The actual location is not what matters most; rather what matters most is that Jesus spoke the words of the Beatitudes!